Located in the heart of Paris is Place Vendôme more than just another big city square, especially to those who like watches and jewelry. 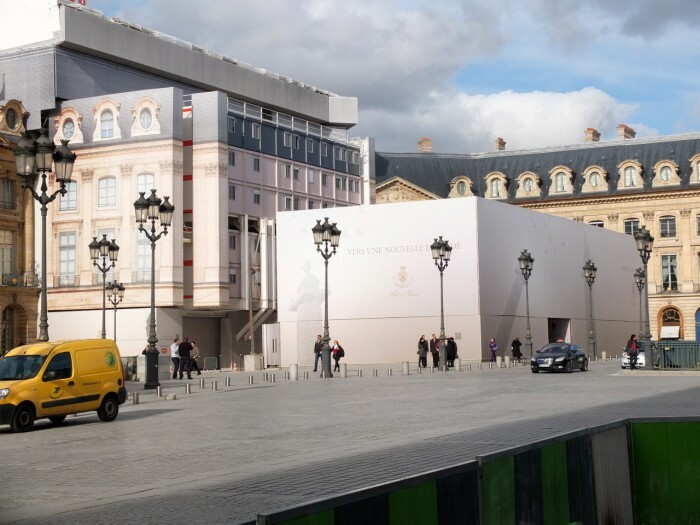 With its stunning architecture, as beautiful as it is impressive, the square serves, together with the connecting Rue de la Paix, as the epicenter of Haute Horlogerie in Paris and perhaps even Europe. Place Vendôme started it’s history, like so many other places in Paris, as a monument to commemorate a glorious victory in battle. In this case one achieved by the armies of Louis XIV, the Sun King, who had the square built in early 1700. 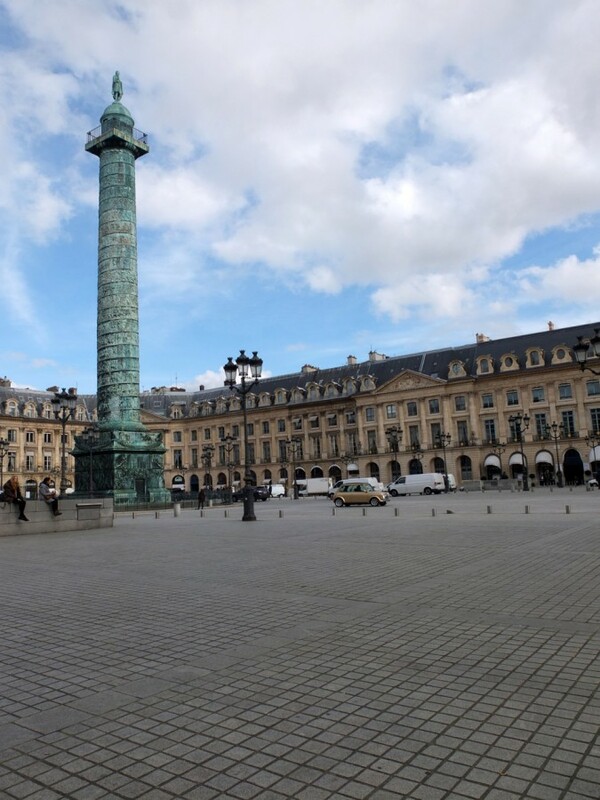 Back then it wasn’t known as Place Vendôme but as Place des Conquêtes, the last word meaning conquest in French, to be renamed Place Louis le Grand quickly and tactically when the durability of the conquests proved to be “problematic”. It was Louis XIV minister of finance that started to give Place Vendôme it’s current look, but because of financial difficulties, the project passed through the hands of several owners, not to be completed until 1720. The square consists out of a so called “Facade”, identical fronts around the square that gives the impression that all the buildings are the same. This is actually not the case, since if you bought a “Facade”, you were quite free to resurrect behind it what ever you pleased. This flexible approach allowed for the construction of apartments, shops and even a hotel, while maintaining the grand integrity of the imposing building. The name Place Vendôme was eventually given to the square because the Duke of Vendôme used to own a hotel on the same location before Louis XIV purchased the area. Prominent in the middle of Place Vendôme is of course the famous Vendôme column. 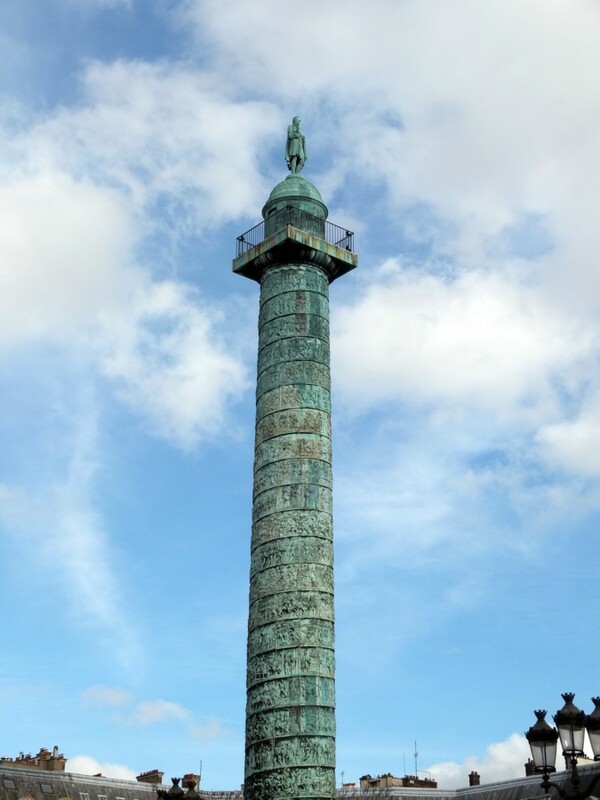 Established in 1810 by Napoleon Bonaparte to commemorate his victory in the battle of Austerlitz, the column features 425 bas-relief bronze plates that spiral all the way up to the top where a statue of Napoleon Bonaparte, complete with laurel crown, is placed. Political changes in France made it that the column was dismantled in 1871, to be re-erected again in 1874 where it stands until today. That Place Vendôme became a square for the finer things in life, started actually when César Ritz opened his famous hotel at No.15 on June 1st 1898. This hotel itself became a legend in its own right, where Cole Porter composed “Begin the Beguine”, Coco Chanel lived for more than 30 years until her death in 1971 and Ernest Hemingway actually stayed so long they named the bar after him. 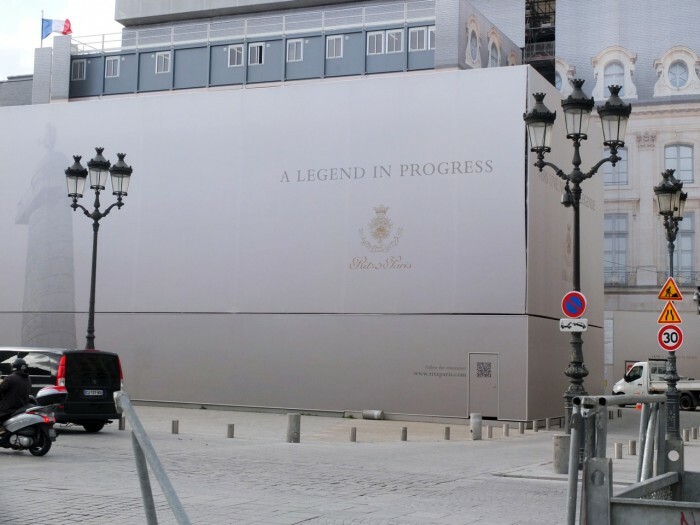 Currently the Ritz is closed for renovation, a project that started in September 2012 and is being executed in the best fashion of the square itself; with an impressive temporary facade, is its construction not imposing on the grandeur of the rest of the square. Next to the Ritz one can find Louis Vuitton, but don’t expect to find a new purse or bag there. This boutique is dedicated to the brand’s Haute Joaillerie collection and was the first of it’s kind for Louis Vuitton. 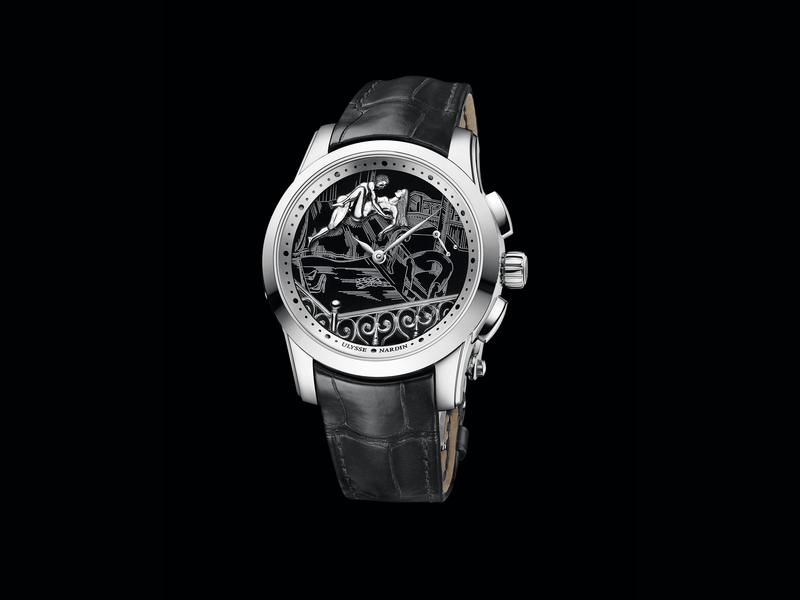 They also have place for Haute Horlogerie by the brand, including the stunning Tourbillon Tambour Monogram. 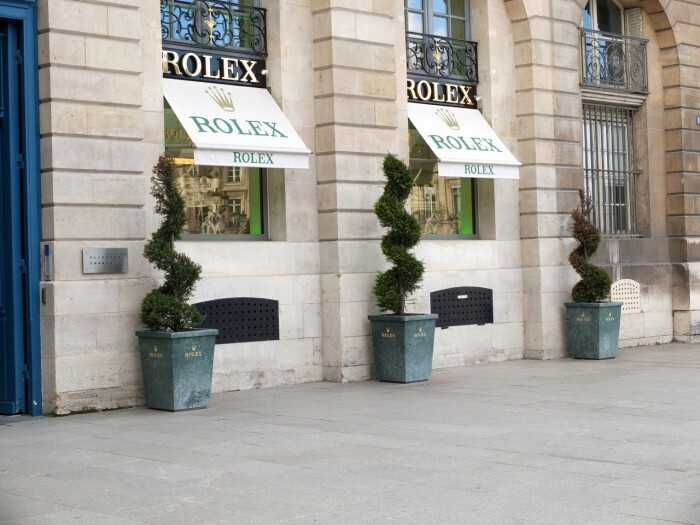 On the other side of the Ritz is where the Rolex boutique resides. Opened in 2008, this Rolex boutique is operated by the Dubail family. 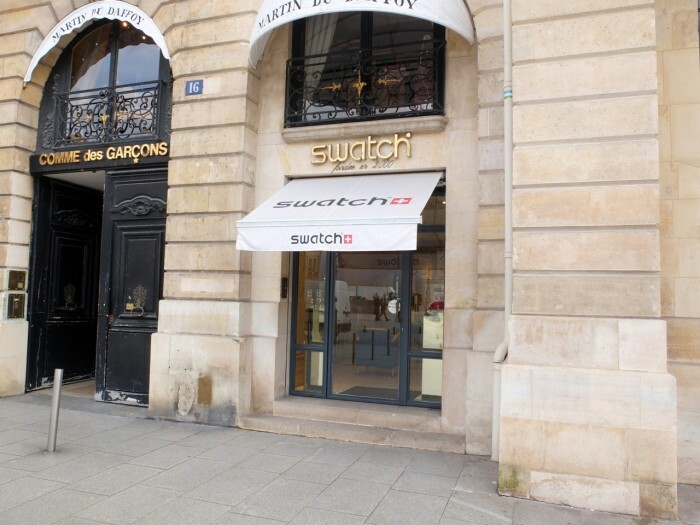 A famous name for watches in Paris since the 1984, and perhaps best known for their store at Rue de Rivoli. The Rolex boutique consists out of three storeys, all connected by a dramatic spiral staircase made out of glass, bronze and, of course, green marble. The basement of the boutique serves as a small museum highlighting the best of Rolex! At Place Vendôme No.7, literally only a few steps from the Rolex boutique, one can find Jaeger-LeCoultre. This boutique was remodeled and reopened in 2012. An extra reason to actually visit these boutiques at Place Vendôme is that because they form the center of the Paris Haute Horlogerie scene they often have very rare watches in stock, from Gyrotourbillons to the most stunning gem-set Haute Joaillerie watches. Place Vendôme No.6 are the historic grounds for Breguet. Although Abraham-Louis Breguet worked a large period of his life, and even passed away in Paris, his workshop was at Quai de l’Horloge, and not Place Vendôme. This doesn’t take away from that fact that it is very likely that Breguet visited the square often during his life in Paris. 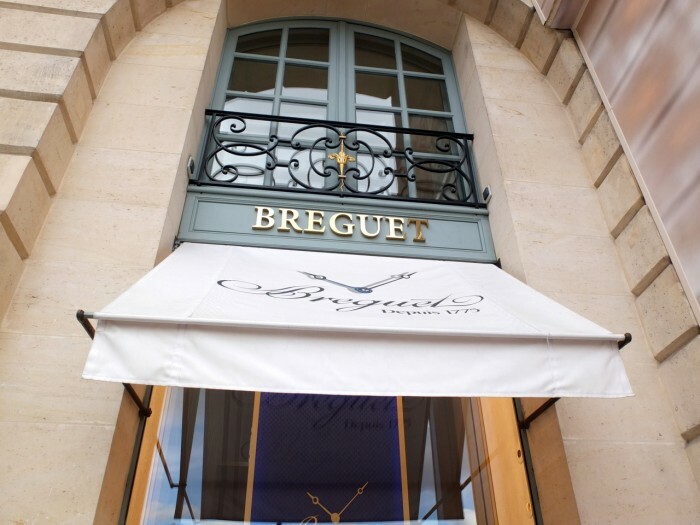 Today the Breguet boutique at Place Vendôme is perhaps the most extraordinary of all boutiques dedicated to the brand since this one houses the Breguet Museum. Dedicated to the Master-Watchmaker that changed the face of time, it contains over two centuries of sales ledgers, repair books and even technical drawings made by Abraham-Louis Breguet himself. The fact that it also contains Breguet’s current collection can almost only count as a pleasant bonus! Place Vendôme is also the square of contrasts, of a horological nature of course since the facades of the buildings offer a consisteny sense of luxury and history. 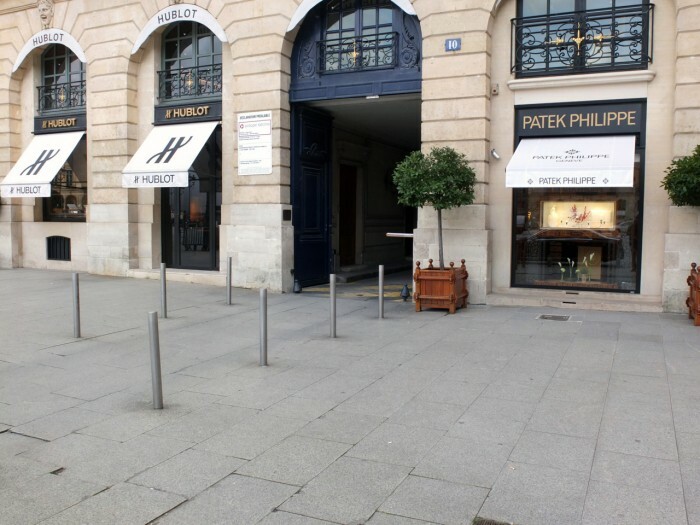 Here one can find the well established name of Patek Philippe right next to that of relative new-comer Hublot. It is however also this contrast that makes Place Vendôme in such a paradise for watch connoisseurs, quite literally offering almost everything the world of Haute Horlogerie has to offer within walking distance. 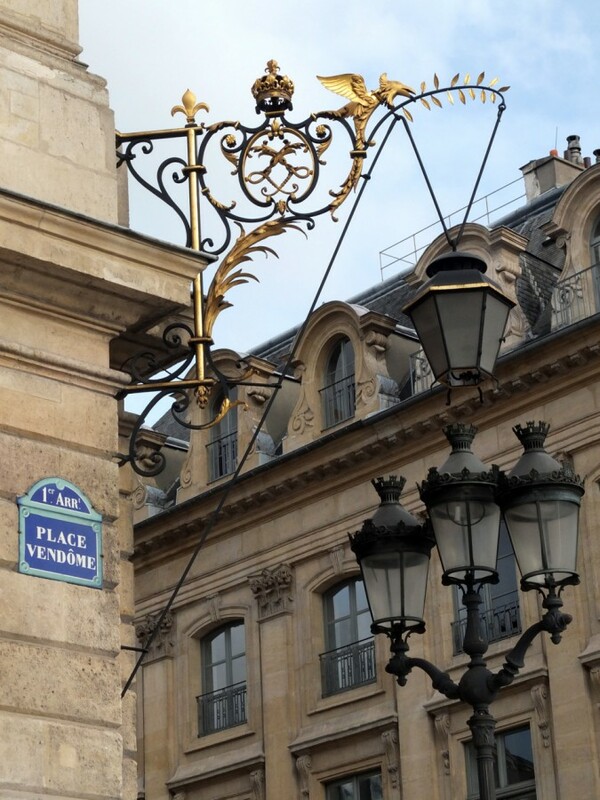 Surrounded by so much history that it is hard to compare, let alone to compete, Place Vendôme No.12 is a strong contender when it comes to location on the square where many historic events took place. Frédéric Chopin lived here shortly and actually passed away at this address in 1849, and during the early 1850’s it was visited often by Emperor Napoleon III, visiting his future wife Eugénie de Montijo who held, just like Chopin, an apartment in the building. 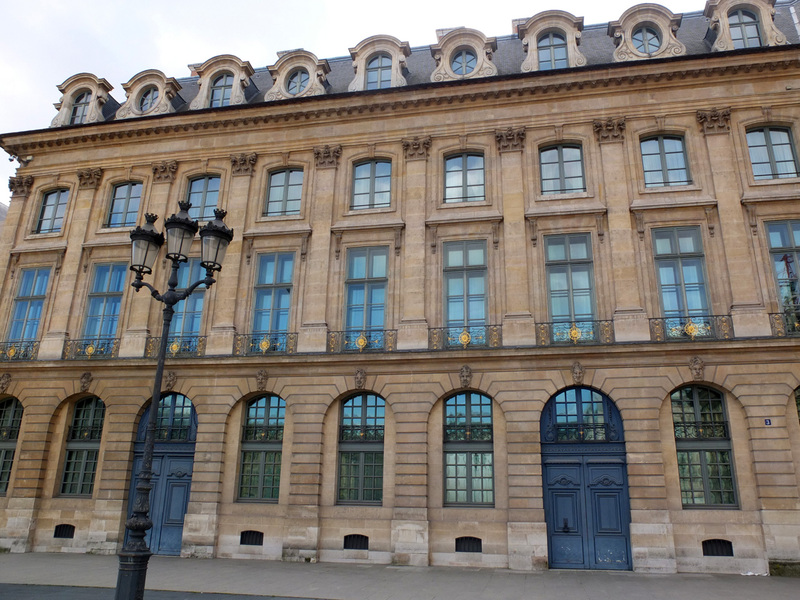 In 1902 Joseph Chaumet bought the former Russian Embassy to house its jewelry and watch business. 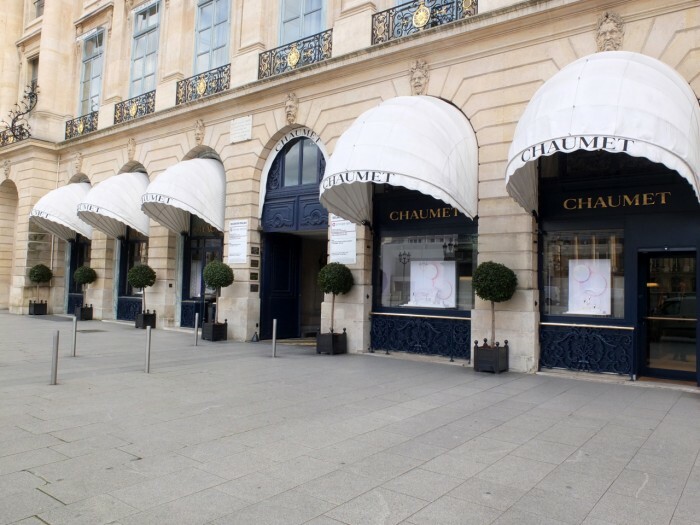 For Chaumet it was a natural place, since the famous brand was already the official jeweler to the court of Napoleon Bonaparte. Although mostly known for its fine jewelery, Chaumet also features a very interesting watch collection, with often innovative designs like the Dandy I wrote about recently. The presence of Swatch might come as a surprise to many, but it actually shouldn’t. Yes, the probably offer the least expensive collection on the square, but they have more than earned their place. Without Swatch there might not been much left of a Swiss watch industry. Over the years Swatch has reached the status of a cult-brand, recently strengthened even more with the introduction of the Sistem51. This picture also illustrates quite well the diversity that Place Vendôme still has. At a quick glance you’d think yourself surrounded by only watch and jewelry store but closer examination reveals that there is actually quite more going on on the square. Antique expert Martin du Daffoy occupies the space above the Swatch boutique, while Japanese fashion label Comme des Garçons is their next door neighbor. On the other side of the passage way to Comme des Garçons houses Piaget. This boutique reopened in the summer of 2013 after remodelling. The Place Vendôme location was the second boutique fitted with an interior design created by Christine Querlioz, following the Geneva boutique. Querlioz is perhaps best known for revamping the women’s fashion department at Printemps Haussman, the famous department store located at the end of Rue de la Paix coming from Place Vendôme. Since the “facade” has to show unity amongst all the buildings only limited options exist on what to do with the exterior, so it is only the interior that the boutiques really get to communicate the nature and traditions of their brand. 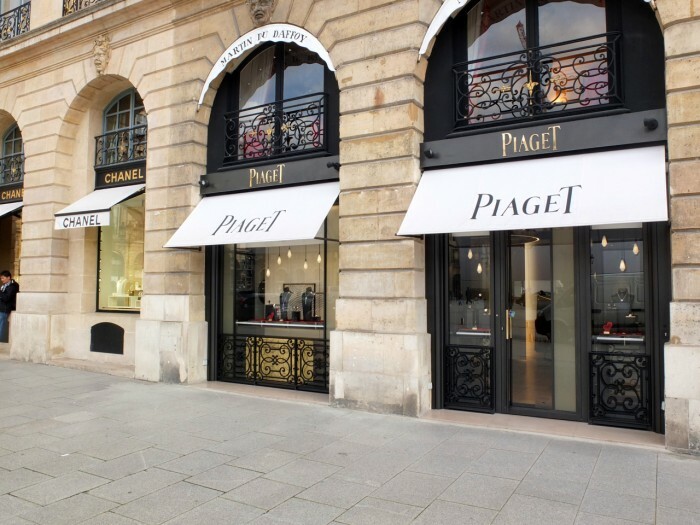 Piaget’s neighbour is Chanel. With Coco Chanel herself living so long in the Ritz on the opposite side of the square, the brand is truly connected to the history of the square. Most people will associate Chanel mainly with the Haute Couture and her famous perfumes, but lesser known is the fact that Coco Chanel presented her first jewelry collection in 1932. These days they also offer a substantial watch collection, and can be credited as one of the brands that gave ceramic a solid place in the watch world. 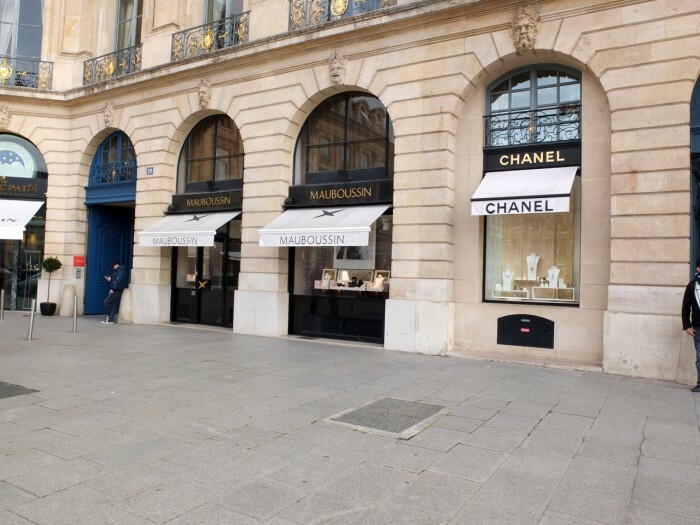 Next to Chanel is Mauboussin, another jewelry house that has firm ties with Paris. The company moved in at No.20 in 1955. 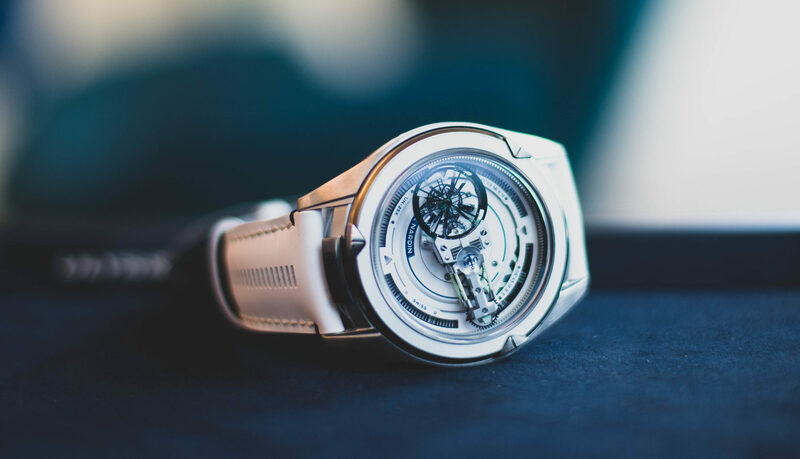 Although they have always maintained a modest watch collection, to many watch connoisseurs they are actually best known for the fact that Richard Mille used to be CEO of the company. The Blancpain boutique at Place Vendôme was relocated there in 2010, from its previous location at Rue de la Paix, just around the corner. 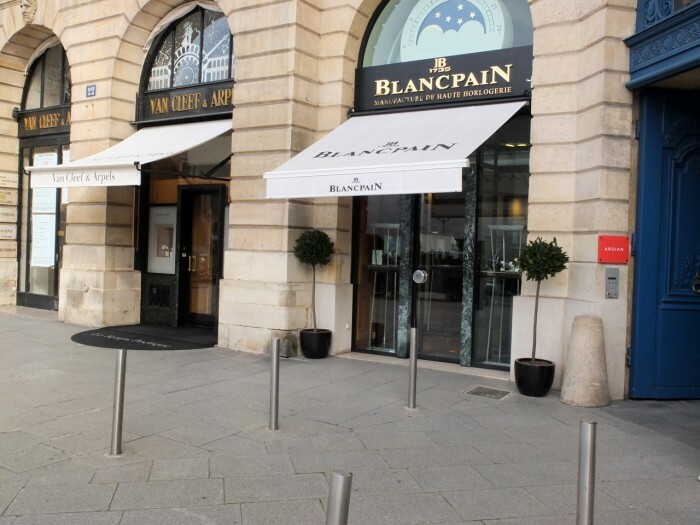 The Rue de la Paix location was opened in 2002, becoming Blancpain’s first mono-brand boutique. Tucked in a relatively small space, it does show how important a presence on Place Vendôme is by their decision to move there. Rue de la Paix is almost as prestigious, yet by being an a historical and quite narrow street, the impact of Place Vendôme is much more grand! 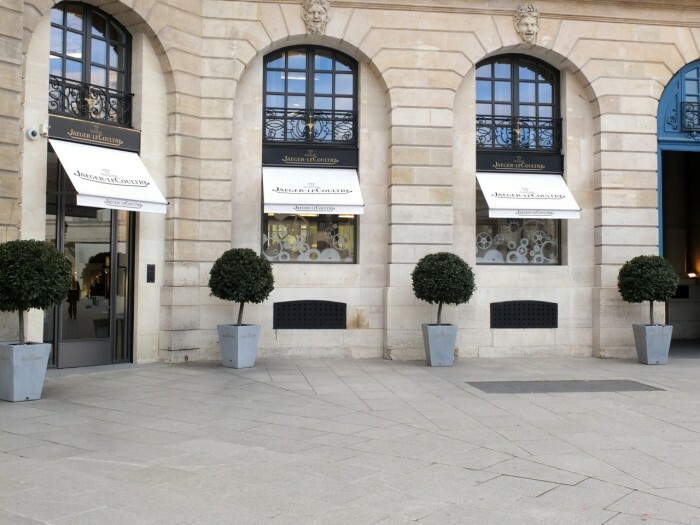 Very prominent at Place Vendôme is Van Cleef & Arpels at No.22. 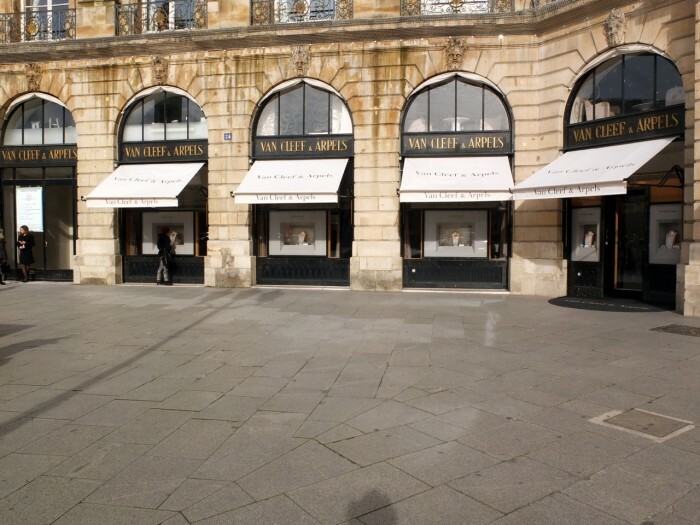 Alfred van Cleef founded the company here at Place Vendôme in 1906 together with his brothers-in-law Charles and Julien Arpels, who happened to be experts in precious stones. Precious stones is also what defined the history of Van Cleef & Arpels, from the legendary Art Deco designs by Renée Puissant to the creation of the “serti invisible” in 1933, a way of setting gemstones without any metal showing. Of course was it also Van Cleef & Arpels that made the jewerly set that Prince Rainier of Monaco presented to Grace Kelly upon their engagement, and who crafted the engagement rings of Jacky Kennedy for her marriage to JFK, as well as Aristoteles Onassis. 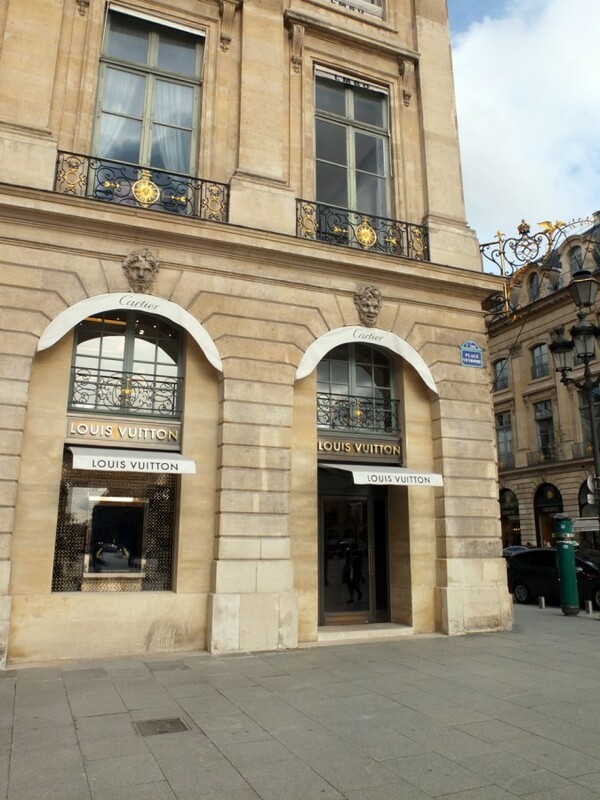 Next to Van Cleef & Arpels is a pioneer amongst Place Vendôme; Boucheron. Already in 1893, Frédéric Boucheron opened his boutique at the corner with Rue de la Paix, looking out over the Place Vendôme. Here Frédéric Boucheron became close friends with César Ritz, who often referred his guests to Boucheron. The store would not only become famous for its extraordinary jewelery, lavish decor and exquisite service, which included a butler serving the same cocktails as the Ritz, but also for a cat. Gérard Boucheron, grandson of Frédéric, had a cat named Wladimir that became a hallmark feature of the store, carefully walking through the display windows and welcoming guests. This was not Boucheron’s only connection to animals since famous actress Sarah Bernhardt ordered many gem-set miniatures of her cat’s, birds and dog. In 1947, Boucheron introduced its Reflet watch, one of which was purchased in 1948 by Edith Piaf as a good luck charm. It must have brought her luck because she went on to become one of France’s most legendary singers. A loyal customer her whole life, it was said that until her death in 1963 she had bought more than 20 of these watches. “A Legend in Progress” does not only summarizes the tale of the Ritz, but says as much of Place Vendôme. It summarizes the long and eventful history of this square in the heart of Paris. A history that is now an indispensable part of the world of Haute Horlogerie and Haute Joaillerie. Yet it is also a history that still is being made, every day, in the boutiques on Place Vendôme, making it indeed a legend in progress. 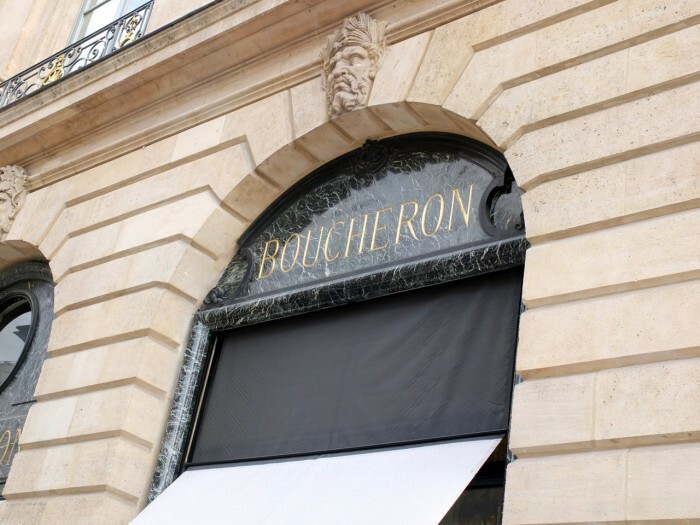 In an upcoming article we go around the corner at Boucheron and enter Rue de la Paix. The street where, amongst others, the legend of Cartier was shaped!